Making liquid soap from scratch involves several stages. It requires multiple hours of cooking and diluting. 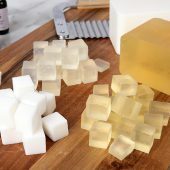 If you’re interested in making your own liquid soap, I would recommend checking out the Liquid Soap Guru Kit, which includes instructions and ingredients to make liquid soap. 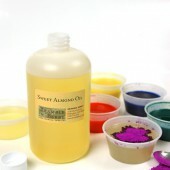 Another option is to use a premade liquid soap base or concentrated paste. Bramble Berry carries several different varieties, see them all here. Liquid soap bases cut down significantly on time, while still allowing you to create and customize a high quality liquid soap product. 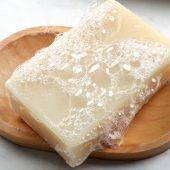 One of the important characteristics of liquid soap is the texture. Liquid soap can range from very thin to a thick gel consistency. It’s important to remember that thickness does not mean concentration or quality. There is no right or wrong consistency, it’s all about personal preference. But, the texture of liquid soap does affect packaging options, and may affect how the product is used. For example, soap that has a thin or medium consistency works well in bottles with a pump top. Soap that is too thick may not work well in pump tops, but instead are better suited for disk caps. Some of the liquid soap bases, like the Castile Liquid Soap Paste and High Sudsing Liquid Soap Paste, need to be diluted before use. The recommended dilution rate is 4:1 water to paste. Diluting the soap is super simple. In a large pot, bring distilled water to a boil. It’s important to use distilled water, as tap water can have microbes or trace metals. When the water is boiling, add the paste and stir to combine. 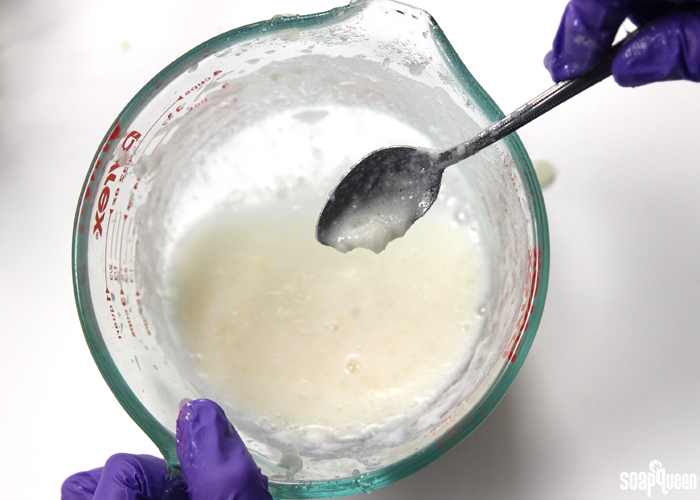 Keep the mixture around 160°F and stir the soap periodically until the paste is fully dissolved. That can take up to 8 hours depending on how much soap you’re diluting. 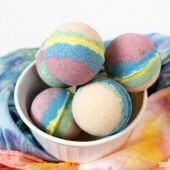 When the soap is dissolved, let it cool and add fragrance and color if you like. 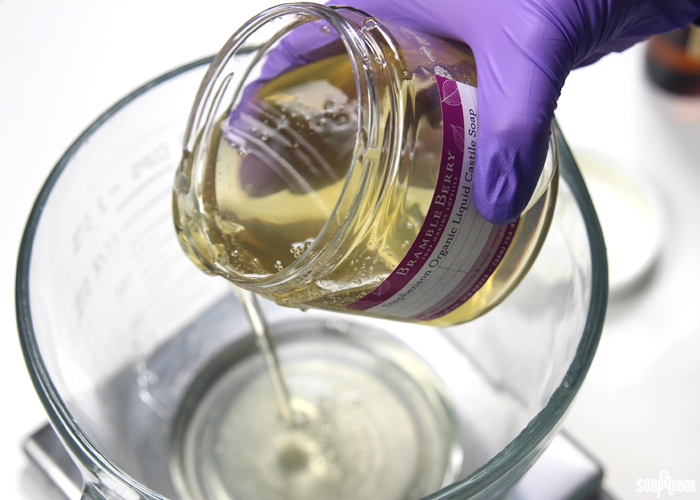 We love using LabColors to color liquid soap with a transparent tint. 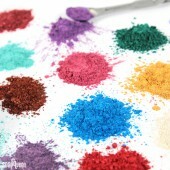 Learn more about using LabColors here. Customizing the consistency of thin liquid soap bases, such as the Stephenson Organic Liquid Castile Soap, is really easy. 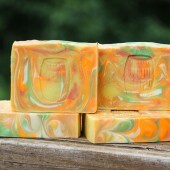 Made primarily of sunflower and coconut oil, this soap base is very gentle on the skin. If you love the formula of a thin soap such as the Stephenson Organic Liquid Castile Soap but want a thicker consistency, it’s easy to change. To thicken, all you need to do is create a salt water solution, and add the salt water to the base in small amounts. To make the solution, first mix 0.5 ounces of plain table salt (just the cheap stuff!) to 1.5 ounces of warm, distilled water. Stir until the salt is fully dissolved. Want to try the Stephenson Organic Liquid Castile Soap, or other Stephenson product? receive $10 off any $20 purchase or more of Stephenson products with the coupon code: SAVETEN. 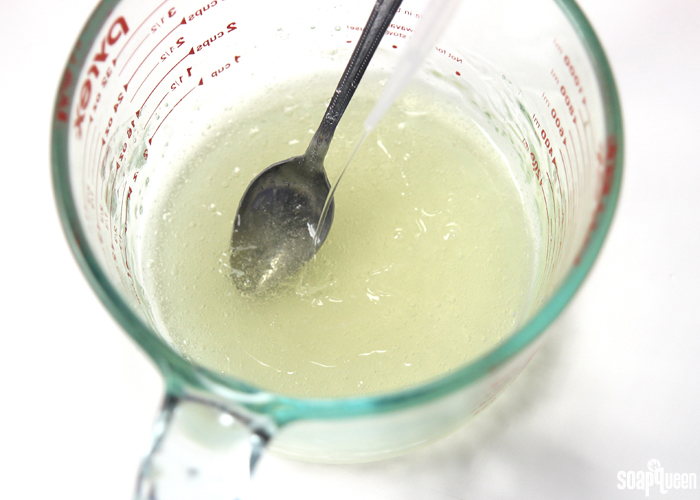 To thicken liquid soap base, first make a salt water solution. 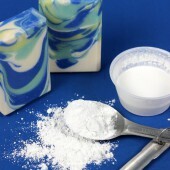 Then, pour your soap base into a mixing container. Add a small amount of the salt water solution directly to the soap base, and stir. 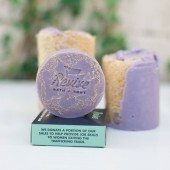 The amount you use will depend on how thick you want the soap to be. Adding 1 mL of the solution is usually enough to see a difference! Continue adding the salt solution (stirring in between each addition) until you reach the consistency you desire. Add the salt solution to liquid soap base to thicken. A little goes a long way! For the sake of experimenting, I tired pouring the remainder of the 1.5 ounces of salt solution into the “flubber soap” to see if it would get even thicker. Adding that much extra liquid turned the soap into an unpleasant, watery, milky consistency. 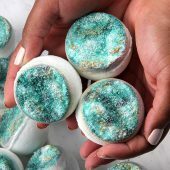 Even though it’s salt water which thickens the soap when added in small amounts, that much extra water dilutes the soap texture. Ick! Sometimes, you don’t need to thicken soap with salt solution because your fragrance or essential oil will do the work for you. 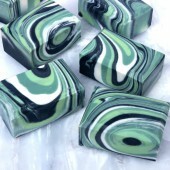 Just like cold process soap, fragrances and essential oils can cause the liquid soap to “accelerate” and become thick. 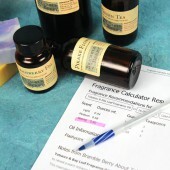 Fragrance and essential oils can also affect the clarity and color of the base. I always like to make a small test batch of fragrance or essential oil in liquid soap to see how it behaves. 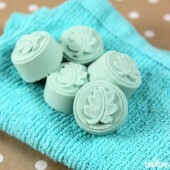 In addition, I recommend adding your fragrance before thickening soap with salt water. After adding your fragrance, you may find it becomes thick enough. Above, I added 3 mL of lemongrass essential oil to 8 ounces of Stephenson Organic Liquid Castile Soap. 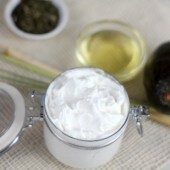 As I stirred in the essential oil, the soap base become a little cloudy and immediately began to thicken. I decided to not thicken this batch more with the salt water solution, as it became nice and thick with the essential oil. The next day, the cloudiness from the lemongrass essential oil went away, and the liquid soap looked nice and clear (shown below). Another option to thicken liquid soap base is with liquid crothix. 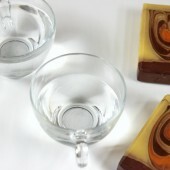 Crothix is easy to use; simply add it to your room temperature soap base and mix until fully incorporated. There is no heating required. Just like using salt water solution, I recommend making a small test batch to find just the right amount of crothix for your project. The recommended crothix usage rate is 1-8% of the total weight of your product. If you have never experimented with changing the consistency of your pre-made liquid soap base, you can see it’s extremely easy! Make sure to only use table salt and distilled water, and add the solution to the liquid soap base in very small amounts. I also highly recommend adding your fragrance or essential oil to the soap base first, as doing so can thicken the soap dramatically. 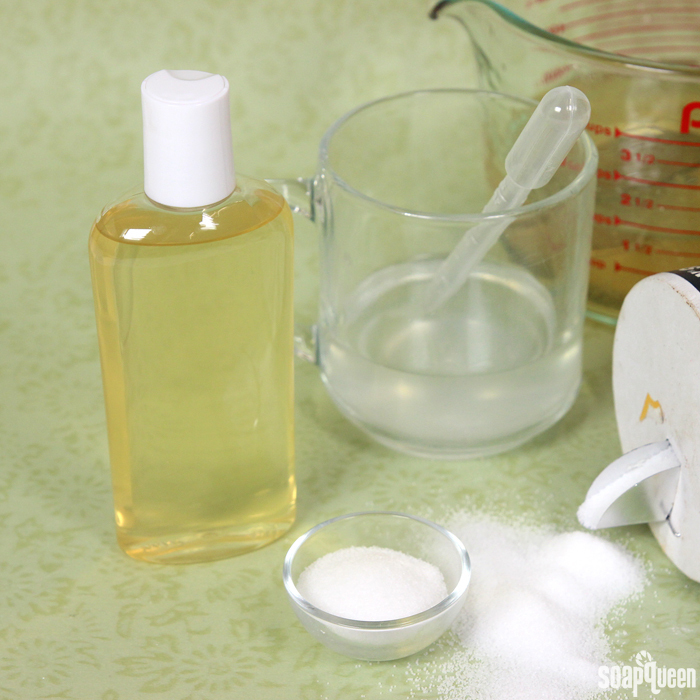 Have you experimented with liquid soap base? Bramble Berry carries several different types, find them here! If you’re interested in more cleaning ideas, keep your eyes on the blog for more recipes and tutorials. 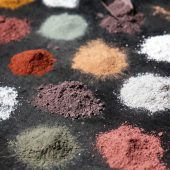 In addition, a collection of cleaning ingredients are 20% off until January 29th with the code: 20PURE. Sale items include baking soda, lemongrass essential oil and more! See all the sale items here. HI, Is there a way to counteract the effect of say… adding too much salt- besides adding water? I made shampoo and wanted to thicken it. I read about adding salt to liquid soap on the Stephensen’s site but added too much. Then I read your post (Thank you!!). So… too late, I’ve got a pot of gel lol. It works well but doesn’t pour well. Any help would be greatly appreciated! Adding more distilled water is the best way to thin that soap back out. Just add a little at a time until it’s the consistency you’re looking for. 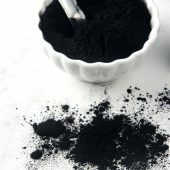 Can you do the same thing with Black Soap? We haven’t worked with a black liquid soap base so I’m not sure. You may separate off a bit of the soap and add salt to see if it thickens before adding it to the whole batch. Hello, does the Stephenson castile soap base have to be used at 100% strength, or can it be diluted with water or aloe and then thickened with the salt solution? That base is already diluted so it’s ready to use out of the bottle. You can add more water or aloe if you like, but keep in mind it may not be as cleansing. 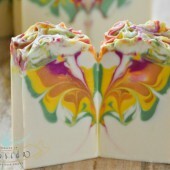 can you add some colours to liquid soap? If so, what colour to use? Labcolor? Mica? I live in Indonesia so it’s very difficult to find labcolors. 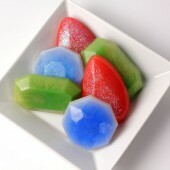 LabColors work best for liquid soap, as micas can settle. 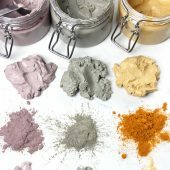 Try to find a colorant that’s FD&C and water based. That should work in a similar way to our LabColors. My daughter found information on another website that suggested that the she could simply add 4oz of table salt to 12oz of Castile soap. I suggested that she start with 2oz, and that resulted in a very hard, crumbly, cottage cheese looking substance that doesn’t very easily crush or melt under hand pressure, and can’t really be used. Is there any way to reconstitute this mess, and make it usable again? Thanks! I’m not sure, it sounds like the salt may have dried the soap out. You may try mixing it with more distilled water to see if that helps. Was your soap at room temperature when you added the salt water? Sometimes it mixes in better when the soap is warm. I have a question about Liquid soap again, please. 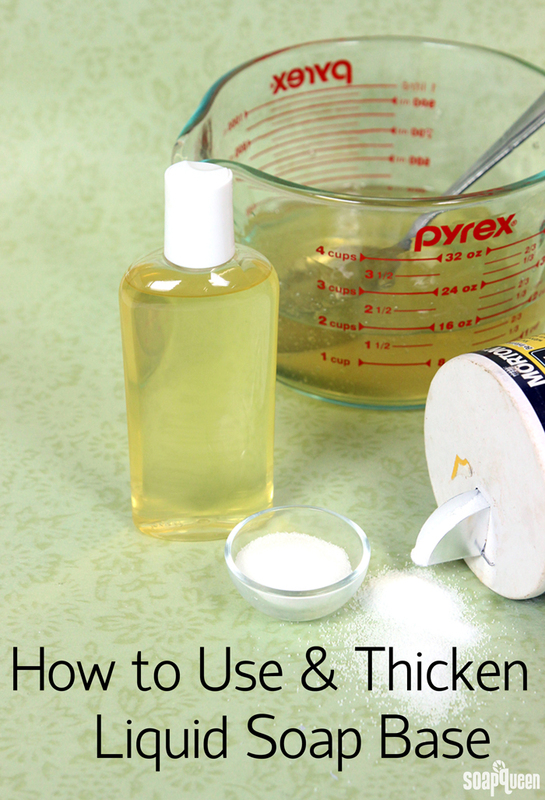 I watched a video online on how to make liquid Castile soap thickens by adding salt solution. When I do this to a certain extent, like 12 tbsp per liter, I get a thick liquid like sauce, but it doesn’t thicken further. It doesn’t become a paste like the video. Why does this happen? Another question, do I have to leave the Castile soap for 2 – 3 weeks to cure before I use it? Would it behave better if I do? Or shall I use it from the second day? I’m not quite sure why that’s happening. The salt can thicken to a certain extent, but we don’t recommend it to turn the solution into paste. 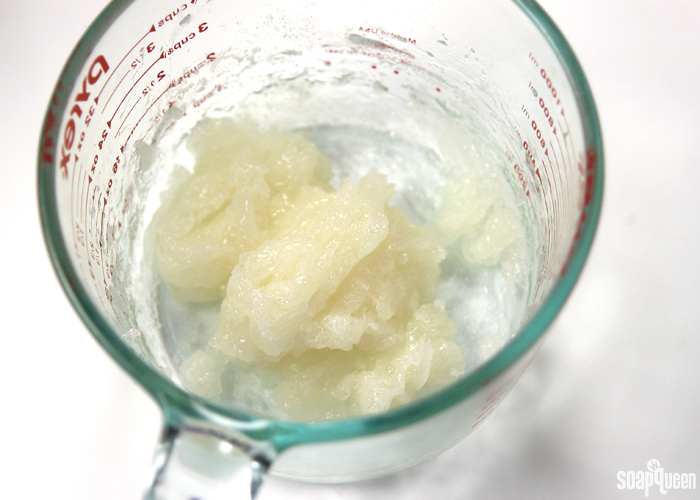 Are you wanting to make a paste instead of the liquid soap? Liquid soap is ready to use once it’s diluted, you don’t need to cure it. Thanks a lot Kelsey for your reply. No, I don’t want to turn the liquid soap to paste. I just want it to be as thick as other store bought shampoos and shower gels. Is there any other non-chemical ways of thickening liquid soap? 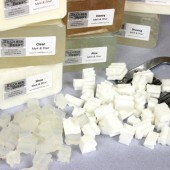 We’ve found salt is the best natural method for thickening soap. You can also use less distilled water to dilute it, that will give you a thicker product. I was searching for a way to thicken the liquid soap and found commentary that suggested carefully (to desired thickness) adding salt dissolved in distilled water to be the answer. I think adding this as an option to your fabulous Lavender and Coconut recipe would have been helpful for me. But I do love your recipe. How long can I use this liquid soap before it goes bad? One week? two ? 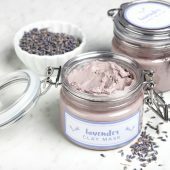 The lavender and coconut recipe, do you remember any of the other ingredients used? I’m not quite sure which one that is. I read a post from this site for an emulsifying Castile soap. I have been fighting with a from scratch cream soap a too thin from scratch liquid soap. I tried the recipe here and it was fantastic except, it was really thick. Two questions, is there a way to thin the lotion/soap and what are the possibilities of it separating after some time? I think I found my answer for cream soap if I can get the portions balanced. Please help if you can. I have BTM, red castor oil wax except for polawax. 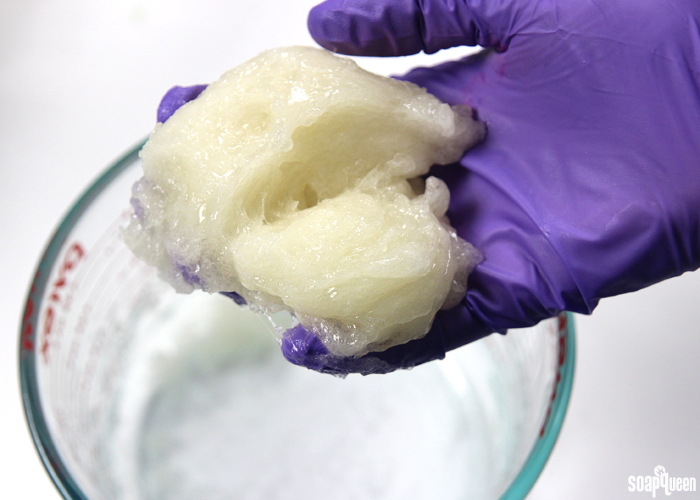 We’ve experimented with cream soap without a lot of luck, so I’m not sure how to thin that batch out. 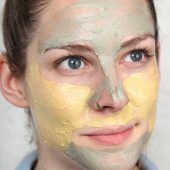 You may see if someone at teachsoap.com/forum knows more. I found today when using the salt technique that if you use a hand blender when it gets all clumpy like that, it will make the soap creamy almost like froth. I tried this recipe and thought it was fantastic. 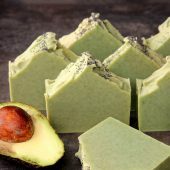 I have made a from scratch cream soap and it is too much to do and thought this would be better, but… What I thought I could do instead is use the recipe from this site for the emulsified scrub but leave the sugar out. When I made this, I followed the directions and made one half with a sugar to make a scrub and the other half just like a lotion sort of without the sugar. The scrub was great so was the other half without the sugar but it was really thick and a little oily like how you would expect a scrub to be. 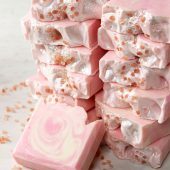 So my question is, could you provide any suggestions on how to thin out the recipe so that it is not so thick and more like a creamier soap? To combat some of the greasiness, I was thinking of adding a bit more liquid soap which may also help to thin it out a little to make it more of a creamy type soap. My apologizes if you did understand my first post 🙂 Thanks for your answer!! We made that recipe specifically as a scrub, so I’m not entirely sure. You can try adding more distilled water or soap, that should make it thinner. You may also try reducing the stearic acid. It makes the mixture thicker. Don’t go below 3%, as it also helps keep it emulsified. I tried to thicken unscented and orange liquid Castile soap with the salt water method. As soon as one drop hit the soap it formed a hard gel bead that couldn’t be mixed out. I used the 0.5 oz salt and 1.5 oz H2O. Could it be the salt I used? I only have pink Himalayan salt. 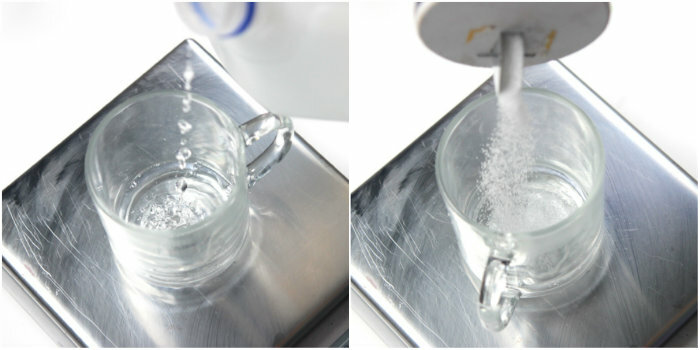 Plain table salt works the best for thickening soap, other salts can have odd reactions. We’d recommend that for your next batch. As for the batch now, you may try adding more distilled water and heating it to try and thin it out. Hi there! I already added my liquid castile soap with peppermint, tea tree and ylang ylang essential oil. Then, thickened it with salt solution. 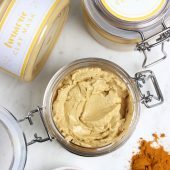 Is it okay if I want to add argan oil, sweet almond oil and aloe vera juice for extra moisturizing and nourishment into the formula. Can those things blended well? We don’t recommend adding extra oil and aloe. Because the base is already made, the oils may separate. The liquid Castile soap on its own is nice and moisturizing. if I combine homemade liquid black, castle liquid soap and vegetable glycerin in a body wash is a preservative needed? if so how much? Also do you recommend using an emulsifier such as lecithin to lotions as well as body wash? You won’t need a preservative or an emulsifier if you add glycerin to your liquid soap, it will work fine without it. I would start with about 1-3% glycerin then add more from there. A lot of glycerin can give the soap a slightly sticky feeling, so it’s good to start with a smaller amount. I usually add honey and oil to your liquid castile soap. The last batch I added frankincense and violet and after mixing there was a seperation of something at the top. Any idea what it might be? Usually doesnt happen. 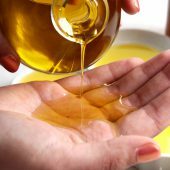 How much honey, oil, and fragrance oil did you add? 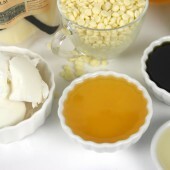 You can add fragrance and color to the bases, but we don’t recommend adding extra oil because it can separate. Thank you for your reply. I have been using 2 parts oil, 3 parts honey, and 9 parts castile soap base. I didn’t use to get seperartion when I eyeballed the measurements. 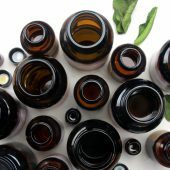 Should I reduce the carrier oil or the essential oils? I think reducing the carrier oil can definitely help. Because the Castile soap is already made, the oil may not mix in fully. It can also help to heat the Castile soap base before adding your ingredients. Then, mix for several minutes. 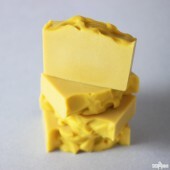 The soap is thinner when it’s warm, which can help you incorporate the oil and honey more easily. I recently got a few gallons of your liquid castile soap base and am wondering how to incorporate goat milk into some of the batches I plan to make. 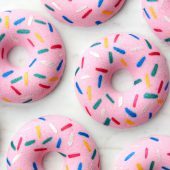 I have been looking for some recipes and have not found what I am looking for. I am not planning to add anything to the soap other than the goat milk and perhaps some EO for fragrance, and salt water to thicken as needed. We don’t recommend adding goat milk to the soap. Because the base is already made, the milk will cut the shelf life to about 6 weeks. After that time, it will go rancid. That’s the case even with a preservative – they protect against mold and bacteria, but they don’t extend the shelf life of soap. We recommend distilled water to dilute the soap. What if she uses goat milk powder? When the powder comes in contact with the water in the soap, it will rehydrate it and shorten the shelf life the same way the milk does. We don’t recommend using goat milk powder to dilute liquid soap. I am using witch hazel distillate instead of water which is supposed to increase the shelf life of the product. I should be ok with the powdered goat milk, right? I like the creaminess it adds tot he soap. Even with witch hazel the goat milk will go bad. You can use it, just expect a shelf life of about 6 weeks or less. Hi I tried to make my own liquid soap with 100% coconut to use as laundry soap. the paste turned out good I diluted 30oz of paste with 80oz water adding in the hot water 8.9oz soda ash (washing soda). the consistency of the was nice and clear. The next morning i saw a film on the top I tried to mix it but the more I mixed the thicker it became. I left it alone for about half hour when I returned it was almost as thick as the paste. What went wrong? I’m not entirely sure why that’s happening. 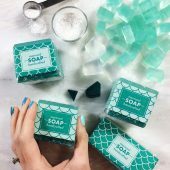 Do you have any soap made without the washing soda? I’m wondering if that’s absorbing the liquid and making it thicker. Also I diluted some of the soap again that turned into paste with equal amounts of water so far is still liquid . I’m thinking maybe I should use only 3rd the amount of washing soda maybe that will help but I don’t know if will have the same cleaning power. Also I forgot to mention the more I stirred the soap the thicker became that seems to me more of a chemical reaction. I think. I think reducing or leaving out the washing soda will help. Coconut oil is a very cleansing ingredient, so it should wash nicely without the soda. Thank you for this! I’m trying to make liquid hand soap for a large community where I live and was wondering how long of a shelf life liquid soap has? We would like to make some in bulk that we can then refill reusable containers but I don’t want to to go rancid. My recipe for 2 cups of soap: castile soap, water, and about 2 tsp olive oil. It’s not quite thick enough, although the oil helped, and so I am going to try your salt solution trick. Thank you for any knowledge, much appreciated! The Castile soap, is that a liquid base, or a solid bar? I used a solid bar, grated it, and dissolved it in water. We haven’t made that recipe, so I’m not entirely sure of the shelf life. 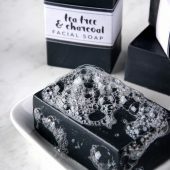 Soap usually has a pH level that doesn’t allow mold to grow, but because it’s dissolved in water that may be different. You may want to add .5-1% preservative just to be extra careful. Then, make a tester bottle to see how long that shelf life is. We recommend adding the salt afterward. 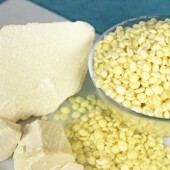 Other ingredients like fragrance can thicken the soap, so you can add the salt once it’s made if needed. We haven’t worked with a lot of those ingredients, so I’m not sure why it’s separating. Do you have an emulsifier in the mix? Hi. Please i tried making a dishwashing liquid soap with base, salt, water, lemon fragnance, thicker, sulfonic acid, and boaster but i woke up to see the soap watery and a lil cloudy. Please can u tell me what the problem is and how i can thicken it? How many extra ingredients did you add? If there was a high amount, the recipe may not stay together. You may try warming the soap and mixing it for 5 minutes or so to see if that gets everything fully emulsified. Just fetch a little soap and add a little bit of salt to escetain if it need salt or not. Great Article! Would Sodium Lactate work at all? Thank you so much! This was so useful! I was just wondering whether it is possible to make bar soap using liquid castile soap rather than lye? If you’re not comfortable working with lye, you can use the liquid Castile soap on its own. 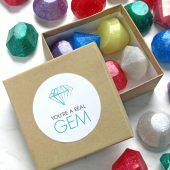 You may also like melt and pour or rebatch. They have already saponified so you don’t have to work with lye. Let stand for at least 8 hrs or until crumbles are completely dissolved. If so how would you incorporate it? I’m not entirely sure if this salt water solution will work for the recipe. You may pour off a bit of your soap and add the salt water solution to see if that helps. If it does you can add it to the full batch. Help! I am trying to make a shampoo that mimics the consistency of commercial shampoos. 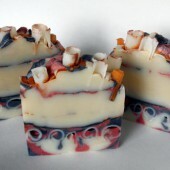 I have a great recipe and have thickened my soap (Stephenson liquid castile) per your instructions. The problem is that is won’t stay thick. It is beautiful when I put it in the bottle and by the next morning it is like water again. What am I doing wrong? Any suggestions would be extremely welcome. I’m not quite sure why that’s happening. How much salt water are you adding, and how are you incorporating it? Let me know and we’ll get this figured out. 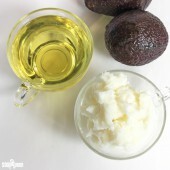 Do you have any guides on how to create creamy sud-free face soap? I really love my current face wash that is very gentle on the skin, contains vitamin E, and is sud-free. I would love to re-create that from scratch! Would appreciate if you could provide me with a little help 🙂 Thank you so much! 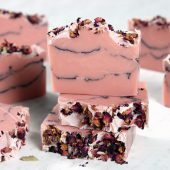 If I’m usever the liquid soap base, where I only need to add water, and I add some essential oils to make the soap “my own” does it need to cure? If so, how long? By the way, I love this site. This is, by far, the most informative I have come across. I’m a beginner and you make things so easy to understand. Thanks a million for your informative website and loads of info. My name is Mona. I am newbie to soap making. I only started in Jan. 2017. I have made two batches of liquid Castile soap. Every time I get a dark brown paste and when I dilute it, I still get dark brown liquid Castile soap. Is it because a stainless steel pot instead of a crock pot? Is it because the heat I use is not low enough? I used olive oil, coconut oil, castor oil and palm oil. It is because of the oils I use? Is it because I take away the lid every 30 minutes to stir the paste so the water in the paste evaporates? One more question how can I make the hand soap more sudsy? I add castor oil up to 10 %. Can it be the sugar? 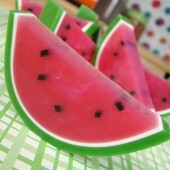 I add sugar to the soap before I cook it. And I cooked it for 6 hours. Is that too long? When I do this to a certain extent, like 12 tbsp per liter, I get a thick liquid like sauce, but it doesn’t thicken further. It doesn’t become a paste like the video. Why does this happens. That explains what happened with a batch of coconut bar soap I made, incorporating coconut milk made by infusing coconut shreds (sweetened) with distilled water. It came out black, but still smells nice and cleanses well. Hello, I wanted to add a small amount of extract that is made with glycerin, no alcohol or water to a soap base. Plus, I would also like to add essential oil for scent as well. 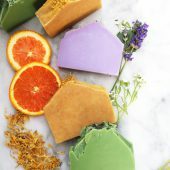 I am looking to purchase the Stephenson Castile Soap from your company, can you please advise as to the best way to incorporate these additions into the soap base. Thanks for your help! Ive been experimnting with the castille soap to make my own liquid handsoap. The thinner liquid works great with a foam pump but for the regular pump bottle I wanted it a bit thicker. As such I used your salt suggestion. But now my soap is seperating in the bottle. Even when i give it a good shake within a minute or two it seperates with a thicker layer on top and a watery thin layer at the bottom. Is this normal? Hi, I am looking at your high sudsing liquid soap paste. I am wondering if once it is diluted, scented and salted, if need be, if I could use the linside soap as a base for my shampoo recipes like I would regular castile? I know you carry a shampoo base but I cannot use anything with slightly etc in it due to sensitivity. I have found over the last couple years as I get older I am developing a lot of sensitivities lol! I am also just starting to make my own soap due to the same problem, cart pending, having to go with the m&p due to no room in my tiny 12×16 ft kitchen to go cp. Hi! I heard that you could make slime by using just liquid soap. I tried to stir the liquid soap, but it keeps sticking to my fingers after touching it longer than a second, despite the thick looks. Does adding salt prevent it from sticking to my hands? Thanks for your time! I’m making liquid soap from scratch and was wondering if I could adjust the pH by diluting it (with a preservative of course) in an acidic liquid like coffee for e.g. Would that work? I know using too much citric acid may cause it to separate etc. Just to be clear, are you adding the salt solution as the actual diluter? Or are you diluting then adding the salt solution to thicken? Can I store the Salt Solution once I make it – and if so – for how long will it keep? I don’t sell a lot of liquid soap, but every time I do, I make a fresh salt solution and would love to be able to have a little bottle of it all made up to use. I have a different question to ask. I bought a Nivea Body wash I. Added almond extract And olive oil to it. Maybe I should not have done this. Is there a way , To thickened the body wash It is not the same thickness I wanted . Thank you. Christine. I’m not entirely sure. Store bought body washes are usually made with surfactants instead of oil and lye, so they may not thicken the same way. I would recommend trying a small bit of the body wash and adding some salt water. If you notice it thickening you can add more to the main batch. Hello, First I would like to say, thank you so much for all of your tutorials that you have made. 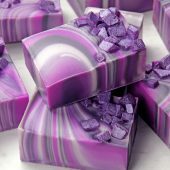 I stumbled on one a while back and it has inspired me to become a soap maker. I started it as a project to help out my daughter that has cancer for her skin, to selling it once a year for make a difference month and donating all of my proceeds to St. Judes , we received a lot of oils and essential oils donated so I decided to take orders during the year and selling it, still donating all to St Judes monthly not just once a year. I have just started experimenting fragrance oils and colors about a month now. But my question is I have just made my first batch of liquid castile soap made with olive oil and coconut oil , (a lot of customers were asking for body wash) I’m about to thin out my base and was wondering if I could add a little castor oil for more bubbles to it while it heats up with the distilled water? It bubbles really nice now but I was wondering or hoping for just a little more. My formula was 24oz olive, 16 coconut, and 9.35 koh. Any advice would be great and an honor thank you for your time. You can add castor oil to your soap recipe before adding the lye and cooking! Using it at 2-5% helps create really nice bubbles in the soap. However, adding castor oil after your liquid soap is made won’t have the same effect. 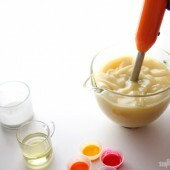 Because the paste has already turned into soap, the castor oil will just float in the soap and possibly separate. So, you can definitely add it to your next batch, but I wouldn’t recommend it in this one. It should still feel great on the skin though, especially with the coconut oil. It creates a nice lather! Hi, I have a couple of questions. First, what is the ph of the finished Liquid Castille Soap? Is there a need to lower it? If so what would you recommend? Also to thicken does it make a difference if the salt iodized or not? I wonder how much salt solution and Fragrance oil or Essential oil to add into 50ml of Castile soap. I would like to make experiment before I make big batch. I have tried making liquid soap from scratch. So far, I have been able to make 2 batches of shower gel. In the first batch, I used 70% coconut oil, 20% Olive oil and 10% Rice Bran Oil. When i diluted it, I diluted it to a 33% shower gel. I then used 25% salt water solution to thicken it. To a 50ml shower gel, i added 12.5ml salt water and i added lime essential oil and i got it to the thickness that i wanted. It was cloudy at first but then it became transparent when i poured it in the bottle and left it for a day. 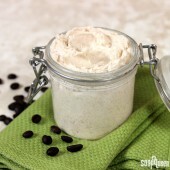 This time, I used 60% coconut oil, 20% Olive oil and 20% Rice bran oil to make the shower gel paste. I diluted this the same way i did last time, into a 33% shower gel. I tried to thicken it again with the same salt water solution. But this time, the shower gel turned into a opaque white. I stirred it continuously but the whiteness didn’t go. I left the shower gel for some time in a bottle and it separated into two separate layers. The upper one was a frothy milky white layer with lots of bubbles. This was incredibly soapy, smelled nice and had good lather. But the other layer was very watery. This was also soapy but lesser than the frothy layer. Other wise it was the same. Decent lather and smelled good too. Why was there so much of a difference?? Was it because of the change in oil concentration? I could really use some help here. The soap had finished cooking. I had run that test earlier itself. Maybe if you could provide me with your email, I could send you pictures of what has really happened. Also I had another question, recently I bought a crock pot in which I cooked the second batch of shower gel paste. Do I need to leave the lid open of the crock pot while cooking the paste? 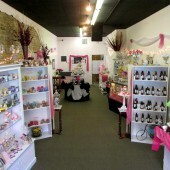 You can email our customer service team at info(at)brambleberry(dot)com with pictures! They can help you out. If I know how much water I will add later, can I add the salt earlier in the process? As in, can I add it to the concentrate base and then add the water later? Also, can I just use tap water instead of deionised water? If I do, how will the results differ? Hi Kelsey I was just wondering if a preservative needs to be added to the liquid soap made from the Concentrated Castile Soap product since we are adding water to it? 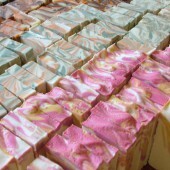 I have the natural liquid soapmaking ebook by catherine failor. In the hot process method that she has described, she has mentioned that the soap mix after adding the potassium hydroxide solution needs to be rested overnight after mixing it in and only the next day does it need to be taken for cooking. Why is this needed? Is it necessary? Will it ruin the soap batch that is being made? I want to make liquid soap but im not sure about the equipment that I need to use. I am thoroughly confused between a slow cooker, rice cooker and a crock pot. I am not sure which is used so I would like some help. Also I would appreciate if you can give me some links of the kind of cooker I need to use. While you can use a slow cooker or crock pot, you can also use a 8-12 quart pot that is enamel or stainless steel. Then, place a 5 gallon canning pot that can fit inside. This will essentially create your own double boiler. We have used this setup many times, and it works great as well! You may find out Liquid Soap Guru Kit helpful! It’s full of recipes and information on how to make liquid soap. I saw in one of the reviews that a lady had added some cocoa butter to one of her bases? 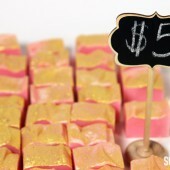 I’m wondering if the SoapQueen might create another post on her blog about some different ideas of “tweaking” the liquid soap bases for a more custom option? For example what type of additives may work in them etc? I’m looking at the Castile soap paste and the Organic Stephenson castile soap base? 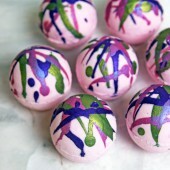 There has got to be a way to customize them and a recipe or two on the SoapQueen’s blog would do wonders for that! 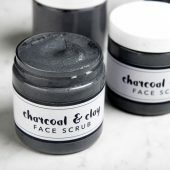 Hi, would this work with Himalayan Salt or Dead Sea Salt? When adding FO to liquid soap base, it becomes thin. Before I try the salt solution, I would like to know if the scented base will thicken the longer it sits or do I need to go ahead and add the salt solution. Like stated before the base became thin after adding FO and I would hate wasting the product. Is it okay to add the salt solution after it has been scented? Does the scented base need to be warm? I apologize if these questions have already been asked, I can only read so much on my phone. 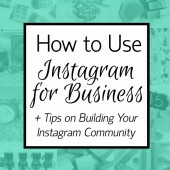 I love your site and have learned so much – thank you!! When thickening the Stephenson’s Liquid Castile base with a salt water solution, do I need to use a preservative since it would be adding water – or does the Ph of the base still protect it from bacteria growth – since it’s such a tiny amount. Can the salt solution be added to room temperature liquid soap or does it need to be warm? I was wondering your thoughts on using sodium lactate as a thickener in liquid soap. i have a problem – i have made a fragrance-free clear liquid soap. When diluted, it is very clear – it can sit for months and still remain clear. However, when i add 1% HEC, the soap does come out clear however, after a while (days to weeks), a thin cloudy layer forms on top. I have tried storing the thickened soap in the dark – but layer always appears after a while. I’m wondering if it’s the climate (Jamaica, West Indies). Also – i tried heating to remove the cloudy layer but it still comes back after a while. hello, is it OK to add a little lotion to liquid handwash to increase the scent? I diluted my soap paste and it looked clear. Then I added my essential oils and it went cloudy. This didn’t happen when I bought pre-diluted Castile soap. Any idea how I fix this problem? Does it still work if it’s cloudy? Do I need to add a preservative to a body wash containing: honey, coconut fractionated oil, vitamin E oil, and castile soap? Which preservatives would you recommend? What would the the shelf life be without a preservative? Also, would glycerin act as a preservative in a salt scrub? Are there preservatives that areally parable free and non toxic? 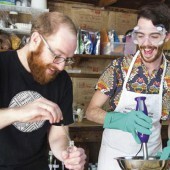 Thanks for all the info on soap making. I have found it beneficial. I tried to make my liquid soap with more bubbles but now have problems thickening it with salt because of the higher levels of coconut oil and castor oil. Do you know the percentage that can added before they become a problem? I have read that borax wont thicken with higher levels of coconut oil also but I don’t know what the higher level actually is. Its a bit of a challenge to balance bubbles and thickening. Does the liquid crothix have these complications? Also do you have information or can you direct me to a link that gives the behaviour of essential oils in liquid soap (some thicken more, some prevent it and it seems one blend I used curdled the thickening)? 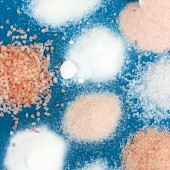 I noticed that you mentioned that table salt is better than Dead Sea salt. I presume that applies to Himalayan salt too? Hoping you can help and thanks for your time. You’re welcome, glad you find the information beneficial! Also, we don’t have testing information for all our essential oils. Sorry about that! 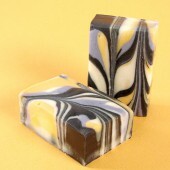 I do know lemongrass essential oil thickens the soap a bit. 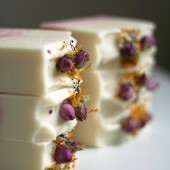 I would recommend making a small test batch with the essential oils to see how they perform in soap! 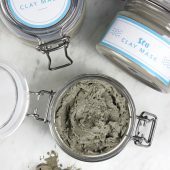 Can other salts like Epsom salts be used for thickening and preserving / preventing bacterial growth? I have a magnesium deficiency and would love a way of getting it through showers too. Besides, I wonder whether the table salt is absorbed into the body. Push come to shove, will I need to combine table salt with Epsom salts to get the thickness AND preservation AND health benefits? What if after adding the FO it gets a little too thick…is there a way to thin? I have a question that seems a bit odd to me, but I’m hoping that this is something that you have come across before! I am using stephenson organic liquid castile soap to make hand soap. I started out with 3 ml of fragrance oil in 8 oz of soap to see what the result would be. It’s very nice, but I wanted the fragrance to be stronger. I made another 8 oz batch this time using 6 ml of FO . The soap thickened up DRASTICALLY ( which I have no problem with) and it’s still just as thick ( but back to being clear now) 24 hours later. The problem is that in this second batch, I can hardly smell any fragrance at all. I tried this with 2 different fragrances and got the same results with both. Any idea why this might be happening? As always, thank you SO much for your suggestions and advice!! Certain fragrances can thicken liquid soap! 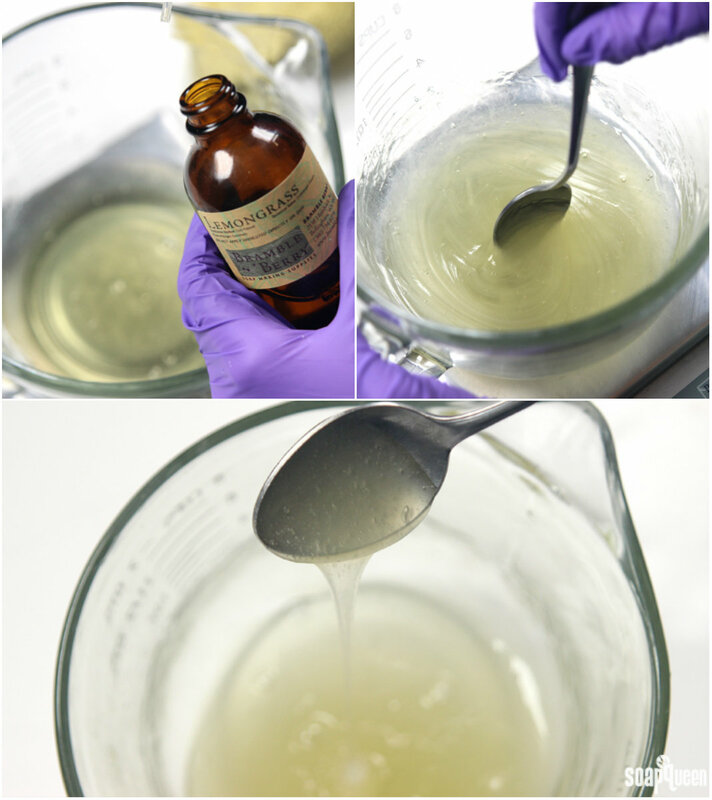 In the pictures above, you can see the lemongrass essential oil we added to the batch thickened our soap up. I’m thinking that’s what’s happening with the fragrance you’re adding. I purchases the Stephenson liquid soap base. I wanted to thicken it so i added 3% scent oil and then added my salt solution. after mixing well, the color is what and it has a nice thick consistency. after a day, it sort of separates. the bottom becomes yellowish (like the original color of the soap) and the tip is a foamy, whiter color. the whole thing still has the thick consistency but the look is not appealing. why is that happening? how can i make it stay white? Hi there! I’m having a bit of trouble with separation. I add jojoba & apricot kernel oil to my soap base, along with a little salt dilution and, though it thickens to a nice consistency at first, when it sits for a while the whole thing separates. Will I need to add an emulsifier? We don’t recommend adding extra oil to our liquid soap bases. Because the bases have already turned into soap, the extra oil will separate. The soap does feel great on its own though! First off, I’d like to say thank you for these amazing tutorials and the ability to ask you questions directly. This is extremely helpful to reference as I am learning how to make lotions and soaps the right way the first time! I was curious about adding preservatives to the Stephenson liquid soap base that you used above. Is it advisable to add something like Phenonip just to be safe? Also , in your experience, how many ounces of fragrance oil and possibly Phenonip would you add to 24 ounces of liquid soap base to get the best results? Thank you so much, Kelsey!! When it comes to mixing the fragrance oils and the liquid soap ( and possibly a little salt solution ) how do you suggest it be done to get the best results? 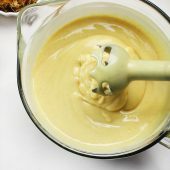 Would you use an immersion blender or just manually stir it in and for how long? Just wondering if you can use Castile base, to make a foaming hand soap? Thanks for the informational article! 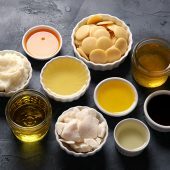 I wondered how exactly to use salt solutions, and I know from past experience that sometimes the fragrance oil works just as described and can surprise you. I wondered about the “liquid castile” soap, it is described as being made with sunflower and coconut oils. I had thought that to be a castile soap, it was made only with olive oil. 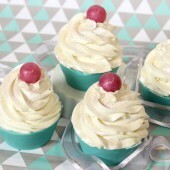 Have you considered making a kit for making cream/whipped soap?